These Colleges Have the Lowest Acceptance Rate and It’s Less Than 10% - 24/7 Wall St. The recent college admissions scandal shows the lengths to which parents will go to get their children into high-end colleges. However, at most American colleges, more than half the applicants are accepted. However, there are four exceptions where the acceptance rate is so low that less than 10% of applicants get in. Research firm Pew looked at 1,364 four-year colleges and universities that had admissions data for the period from 2002 to 2017. The four colleges that accept fewer than 10% of their applicants were Stanford (4.7%), Harvard (5.2%), Yale (6.9%) and Northwestern (9.2%). Notably, all four were among the top 10 rated in the new U.S. News National University Rankings. Harvard ranked second, behind first-place Princeton. Yale tied for third. Stanford ranked seventh, and Northwestern tied for 10th. Tuition and fees at the four were over $50,000 a year, which means they are among America’s richest universities. These four institutions were very different in terms of admissions rate from the other colleges studied. Twenty-nine schools admitted between 10% and 20% of applicants. According to Pew, these included Georgetown (15.7%), the University of Southern California (16.0%), UCLA (16.1%) and the University of California, Berkeley (17.1%). Among all the institutions covered, more than half of them (53.3%) admitted two-thirds or more of their applicants in 2017. These included a number of well-known and highly ranked schools for quality education: St. John’s University in New York (67.7%), Virginia Tech (70.1%), Quinnipiac University (73.9%), the University of Missouri at Columbia (78.1%) and George Mason University (81.3%). Despite many of the high admissions rates, they have fallen at a number of colleges. Pew reports that 45% of colleges in the survey had cut admissions rates by over 10% since 2002, the period over which Pew measured the trends. The reason was not necessarily that admissions offices had become more aggressive. A growing number of students apply to multiple colleges. Pew researchers point out that “In absolute numbers, schools are making more admission offers than before, but not enough to keep pace with the soaring number of applications.” Total applications to colleges covered by the research rose from 4.9 million in 2002 to almost 10.2 million in 2017. Applications are currently on the rise at 100 or more major schools. Why have applications risen so fast? 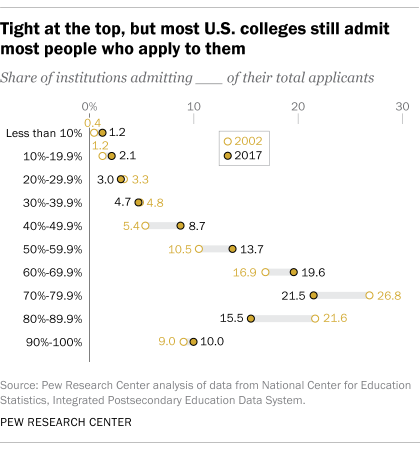 Pew believes that among the primary reasons is the so-called Common Application, which allows students to apply to numerous colleges at once. Of the research pool of 1,364 colleges examined, 729 used the Common Application as part of their admission process. Almost certainly none of these trends affect the admissions pools or process at the four colleges that admit fewer than 10% of their applications. Harvard said it accepted only 4.59% of the people who applied for the class of 2022, an all-time low. Each of these schools is also among the hardest colleges to get into by state. Pew pulled information on applications, admissions and enrollment from the Integrated Postsecondary Education Data System, a program of the research division of the U.S. Education Department’s National Center for Education Statistics. The analysis was restricted to schools for which there were data for both 2002 and 2017.